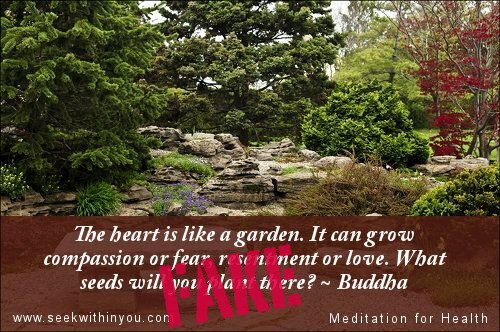 Even the ‘heart is like a garden’ quote is not from Buddha, I feel it is quite true and reasonable. While your ‘imagery of seeds’ quote that Buddha has said – well, clearly BEFORE it got translated – is totally confusing in itself as presented here. The upper part – a seed grows – talks about something positive, while the lower part – aversion & delusion – is clearly negative. There is no connection between these 2 parts, which will has happened somewhere in the translation stage. Certainly the language used regarding the seeds would strike us as quite positive, while the outcome is quite negative. And if you follow the link and read the rest of the sutta you’ll find that the destruction of the seeds is portrayed as being a positive thing, since it leads to the non-arising of greed, aversion, and delusion. So I can understand you thinking that something must have gotten messed up along the way. But there are many metaphors where the destruction of things like trees and forests is portrayed in a positive light that I think we have to accept that the way the Buddha thought about certain things was different from ours. You’d probably find the Bija Sutta more to your liking. It talks about how some “evil” seeds give rise to fruits characterized by “bitterness, acridity, and distastefulness,” while other more auspicious seeds grow into plants with qualities of “sweetness, tastiness, and unalloyed delectability.” These latter seeds are, of course, compared to the Buddha’s path of practice, while the former represent unskillful actions that lead to suffering.